Brighten up a dreary winter day with peppery arugula greens topped with crisp slices of sweet persimmon, buttery avocado wedges and tangy pomegranate arils, all tossed in a tangy mustard and white balsamic vinaigrette. In a small bowl, whisk together olive oil, vinegars and mustard until combined. Season to taste with salt and pepper. In a large mixing bowl, toss arugula with dressing until well coated. Distribute between four individual salad bowls, or transfer to a single large salad bowl. 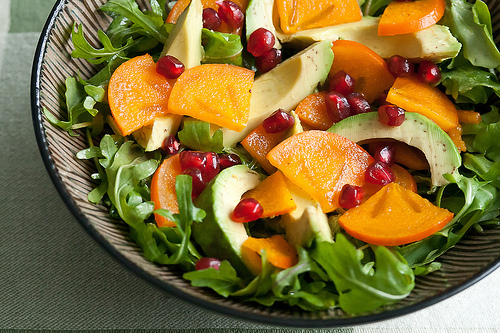 Arrange persimmon and avocado slices on the arugula, then scatter with pomegranate. Serve immediately. The beauty of this salad is the contrast between the crisp, sweet persimmon against the soft, buttery avocado. Make sure to purchase the small, squat tomato-shaped Fuyu persimmons for this salad, as they’re sweet enough to eat even when slightly crisp, as opposed to the larger acorn-shaped Hachiya that are too tannic to eat until completely soft.